An Iowa boy away at college, Verne Lyon was recruited by the CIA to spy on college professors and fellow students as part of Operation CHAOS, a massive surveillance program at the height of the Vietnam War. Framed by his handlers for an airport bombing, he was later sent to Cuba to subvert the Castro regime. Balking at increasingly nefarious missions, he tried to quit: twice kidnapped by the CIA, he landed in Leavenworth. Today a free man, his memoir details his journey through the secret workings of the U.S. government. “Verne Lyon is passionate about speaking truth to power. This book is of historical value.” –James Everett, former CIA Case Officer and author of The Making and Breaking of an American Spy. 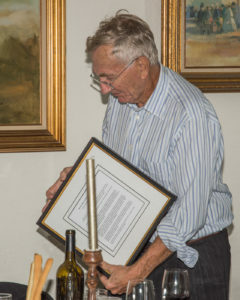 The trademark “Oscar” for Sam Adams Associates for Integrity in Intelligence (SAAII) was presented to longtime investigative journalist Seymour Hersh at a dinner in Washington on Sept. 22. The symbolic award is a candle sitting atop the traditional corner-brightener candlestick holder. Seymour Hersh receiving the annual Integrity Award from the The Sam Adams Associates for Integrity in Intelligence on Sept. 22, 2017, in Washington. SAAII confers its annual award on a member of the intelligence profession or related field who exemplifies the courage, persistence and devotion to truth of Sam Adams, a CIA analyst on Vietnam who exposed lies of the generals in Saigon and was then silenced. Hersh, now 80, first came to national prominence in 1969 when he helped expose the massacre of Vietnamese civilians in the village of My Lai. More recently, Hersh revealed the U.S. military’s torture of Iraqi prisoners at Abu Ghraib prison in 2004 and, in 2014, debunked Western propaganda that sought to justify a major U.S. military attack on Syria by pinning a sarin-gas attack on the government. 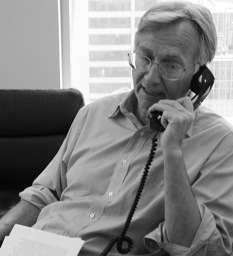 “The Sam Adams Associates for Integrity in Intelligence presents its INTEGRITY AWARD for 2017 to Seymour M. Hersh — Know all ye by these presents that Seymour M. Hersh is hereby honored with the traditional Sam Adams Corner-Brightener Candlestick Holder, in symbolic recognition of Mr. Hersh’s courage in shining light into dark places. “It has been said: ‘The pen is mightier than the sword.’ We are likely to find out soon enough if that is the case. “Sy Hersh, this year’s Sam Adams honoree for integrity, has had the courage to use his unparalleled access to sober-minded senior officials to expose U.S. government misdeeds. This may prove to be a more effective deterrent to President Donald Trump attacking North Korea than the nuclear bombs and missiles at the disposal of North Korean leader Kim Jong-un. “It seems likely that Trump would be more hesitant to risk having to sit in the war-crime dock at Nuremberg II, than he would be to risk the carnage that an attack on North Korea would bring to the entire peninsula, and beyond. Such is the potential power of the pen. Sy Hersh’s pen.